Jasper National Park contains many, many kilometers of trails to enjoy on your Canadian Rockies vacation. They’ll lead you to all sorts of different terrain, in all different parts of the park. Hiking Jasper’s trails is a great way to see wildlife, get great photographs, and do some sightseeing. Experience some of the hikes Jasper National Park has to offer. 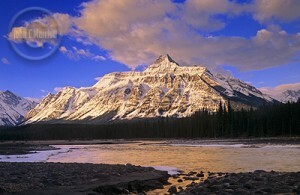 Below you’ll find some hikes in Jasper National Park across the Athathabasca river from town. You can reach these trails by driving east on Highway 16 for 1.9 km to the Moberly Bridge, or south on Highway 93A for 0.6 km, then left to cross the river on the Old Fort Point bridge. For this Jasper trail, you’ll hike Trails 7g and 7, for a distance of 2.1 km one way, taking about 1-2 hours. You can catch the trailhead at Fifth Bridge, 8 km east of Jasper via Highway 16 and the Maligne Road. The Maligne Canyon section of Trail 7 provides the excellent views of Jasper’s limestone gorge, great for vacation sightseeing and photography. Cross the suspension bridge over the Maligne River and keep right at all intersections as you work your way up the canyon, gaining 100 m. Water pours from springs along the hike, and interpretive signs explain how Maligne Canyon is connected to Medicine Lake, 15 km away, by a cave system. Keep right at Second Bridge, leaving Trail 7 to follow the short un-numbered interpretive path past the spectacular waterfall at the head of the canyon to the main parking lot. For this hike, you’ll take Tral 1 for a 3.5 km trip that lasts about 1-2 hours. Reach the trailhead from town or from Highway 16, followong Highway 93A to the Old Fort Point/Lac Beauvert access road. Hang a left, cross the Athabasca River on the old iron bridge, then park in the lot on the right. It’s about 1.6 km from the town to the trailhead. Old Fort Point is a bedrock hill jutting out 130 m above the river. The loop trail over the top of Old Fort Point is steep at times, but rewards with great views of Jasper and the surrounding national park. The fastest way to the top of the hill is to take the steep (really steep) stairs by the cliff. Along the way, you’ll find a Canadian Heritage Rivers plaque about the Athabasca. If you want something a little physically easier, take the path that begins behind the trail information kiosk. Follow Trail 1 up a short hill and on through the woods. 1.3 km into the hike you climb a steep sectionbeside an outcrop of the oldest rock in Jasper National Park. It’s known as a “Precambrian” rock layer, dated at about 750 million years old and is made up of angular hunks of pink limestone. On a clear day, you’ll see a great selection of peaks across Jasper National Park. For this hike, you’ll use trails 7e and 7 for a 7 km hike one way that takes 2-3 hours. You’ll find the trailhead at the visitor parking at Jasper Park Lodge. This is a long hike that mostly sticks to the woods, and is mostly up hill. From the trailhead, follow the yellow 7e markers to the junction with Trail 7. Three kilometres of easy hiking forest brings you to a marsh near a junction with the Lake Edith gated road. Stay on Trail 7 as it turns right and climbs to the upper parking lot at Maligne Canyon. The route loops back to Jasper Park Lodge along the Athabasca River. Total loop distance: 16 km.